Lisa D. Smith (No.20 in the list of female British team members) was born in Milton Keynes on 5th May 1969. Some of her family had been involved in speed skating for some time, but none realised just what an impact young Lisa would have on British skating as the years progressed. Smith started her racing career in the mid 1970's, competing for the Milton Keynes club alongside team mate Alison Hartley, who was almost two years her senior. Right from the word go she was winning medals in club races and not just by a short margin either. Despite this, it was widely recognised that children develop at different rates and that success in the junior categories does not guarantee success in the senior categories. In the late 1970's the Milton Keynes club folded. Hartley followed her father to the Midland based Mercia club whilst Smith became one of the first skaters to take to the track for a new team, New City Rollers. As the club grew some widely recognised names would also appear in the orange and black uniform worn by the Milton Keynes based club. Most notably Debbie Kitchener and Darren Cobley. 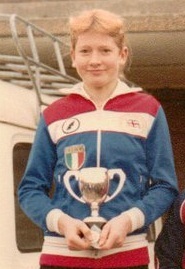 In 1978, aged 9, Smith won her first British Championship medal in the 7-11 years category. It was a silver behind North London's Karen Hodder on the 480 metre cycle track at Southampton. A year later she would turn that silver into gold, again at Southampton and repeat the feat a year later. 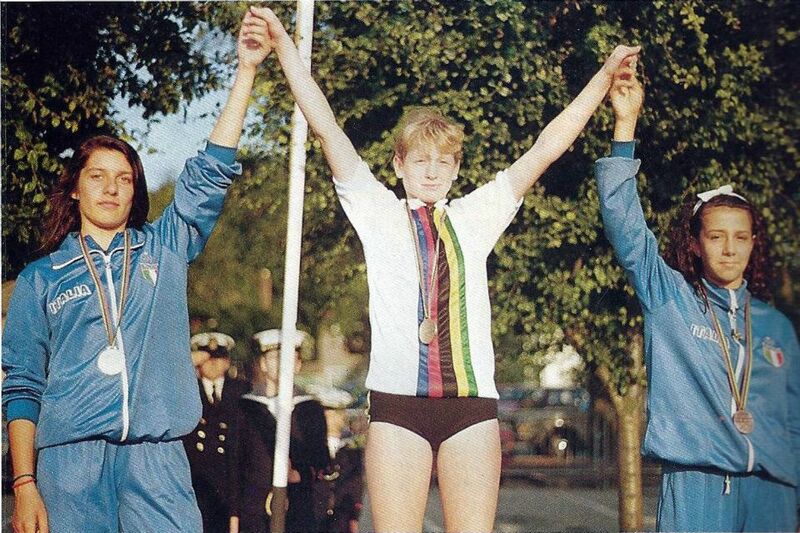 In 1981 just 18 days after her 12th birthday she medalled in the girls 500 metres British Championship on Palmer Park, Reading, behind Wisbech's Hayley Walton. The following day, though, Smith again turned silver into gold and swept to victory in the 2000 metres. Even now, as young as she was, her performances were starting to look the real deal. In fact, so impressive was her performances that in the July of that year she was selected to represent Great Britain at the Junior European Championships in Pamplona, Spain, becoming one of the youngest skaters to have ever represented Britain in a major international. By 1982 Smith had again moved up a gear, but so had former team mate Alison Hartley. 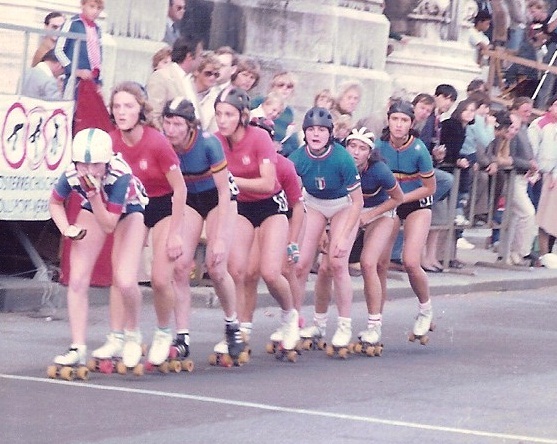 That season was the start of a rivalry in British female skating that was unparalleled either before or since in British skating history. On 20th June 1982 the British Championships were on Tatem Park. There were only two Championships for the 11 to 15 year olds (as was the age grouping back then) and Tatem was host to the longer distance, the 2000 metres. Smith was defending Champion and preferred the longer distances (the other Championship being the 500 metres). However, Tatem Park is notoriously fast, in fact it is one of the fastest tracks in the world. Smith took to the track as favourite but it was Hartley who took gold ahead of her. Just a few weeks later, the pair were again thrown together when they were both selected for the Junior European Championships in Rieti (track) and Marina Di Grosseto (road), Italy. Smith came out on top winning a bronze medal for Britain in the 1500 metres, which not only gave Britain its first ever Junior Girls medal in a major international competition, but also made her the youngest British skater ever to do so. A few weeks after that, on Palmer Park, Smith reasserted her authority and took gold ahead of Hartley in the 500 metres. The rivalry had begun. In 1983 Hartley had moved into the seniors and was winning British titles in that age group, whilst Smith was still taking gold in the junior age groups. That said, she was beaten into third place in the time trial on Tatem Park, reiterating the fact that sprinting really was not her speciality. With Hartley also joining the senior team for the European Championships in Italy, the couple had a brief respite from each other. Smith had again changed clubs, this time it was to the established Alexandra Palace club, steeped in history with the likes of Bob Halford, Eddie Stumbke and Mick McGeough as its members to name but a few. In fact, McGeough was still heavily involved, having recently retired from international skating he was now coaching his sons, Sean and Neil, to a decent standard. Not only was Smith benefitting from McGeough's coaching, but back home in Milton Keynes one of her training partners was none other than senior international, Darren Cobley. With McGeough's advice, Cobley's strength and Smith's own grit and determination to be the best, she was well on the way to realising those dreams. Smith again represented Britain at junior level, this time in Nantes, France, and was once again a medallist - bronze and silver on the road (1500 metres and 3000 metres respectively) and silver on the track (3000 metres). She was not allowed to compete the full distance of 5000 metres due to her age, so what she might have achieved in the longer distance will always remain a question. Still only 14, the prospects for Smith were looking very impressive. In 1984 there was no stopping her. She started the year off with a win in the Junior British Championships in her weakest event, the 300 metres time trial, on Birmingham Wheels, a track which would become so significant in her skating career just a few weeks later. In July she was again representing Britain in a major international, but this time the pressure really was on. The Junior European Championships were on home soil for the first time ever. In her very first event, the 300 metres time trial on the road in Sutton Coldfield near Birmingham, Smith could only manage 13th. But all that was to change. In fact in the next four events she would take no fewer than four medals - three bronze medals and a gold in the 1500 metres. With so many "firsts" already under her belt, she became Britain's first (and only) Junior Girls European Champion. A few days later an racing switched to the track at Birmingham Wheels. Again, her time trial performance was dismal, but again the remainder of the competition arguably belonged to her. A further two silver medals and yet another gold, again in the 1500 metres, cemented her name into the history books as one of our greatest female skaters. The senior team was readying itself for the World Championships in Bogota, Colombia in August, and on it's return it found it had a new team member who would be joining them for the Senior European Championships in Vienna, Austria - 15 year old Lisa Smith. There were no high expectations for Smith, after all she was still only 15, but despite her years she proved again that she was not just a good skater, she was world class. In the 10000 metres on the big 400 metres cement track, Smith would get her first senior medal - a bronze. This was nothing short of remarkable. Hartley, however, was to also take a silver and a bronze. The rivalry was rekindled. As a pair they would also prove to be formidable in the relay by obtaining 4th place with just the two of them in a 3-man race! On her return to Britain there was still a small matter of two races left in the Junior British Championship, which of course Smith won making it her first clean sweep. In 1985 Smith moved into the senior ranks proper. She arrived not just with a bang, but more like an explosion. She took every single senior British title, sprints included, as well as winning the Vi Kirby Handicap from scratch. Not since the days of Chloe Ronaldson had this been done. She would also go one better in the European Championships with a silver on the track in Cassano d'Adda as well as two bronze medals in the track and road relays. This time Smith and Hartley were joined by Debbie Kitchener (track) and Kerry McLaughlan (road). In September of the same year Smith took part in her first ever World Championships in Colorado Springs, USA. Her highest individual placing was 5th in the 10000 metres whilst again, 16 year old Smith alongside Hartley and this Lisa Burgess, would take home a medal in the relay - again bronze, and Britain's first female World medal since 1967! In comparison to her earlier triumphs, 1986 was a lean year internationally for Smith. Despite her second clean sweep in British Championships the only major international medal she would take was a bronze in the European Championship relay on the track in Finale Emilia, Italy. Despite her lack of medals the bigger picture was that she finished a close 4th on two occasions on the road and 5th on the track. In addition, the relay bronze was gained with just Smith and Hartley again making up the British team and for the first time obtaining a medal without a third skater. Quite remarkable when you consider the class of opposition the duo were up against. The World Championships in Adelaide, Australia, however, really were a relative none event for the teenager. There are a number of factors that could have affected her performance - the fact the circuit was technical (i.e. it was known to be a bit of a "goat track" and had a right hand bend); maybe jet lag with the Championships being so far away; maybe even a change in lifestyle? After all, Smith was still only 17. The reason for Smith's form is unclear, but what is clear is that her highest placing of 10th in the 10000 metres was average by the high standards she had set herself in previous years. When 1987 came around Smith had returned to form. Admittedly she fell just short of a consecutive third clean sweep in the British Championships when Hartley beat her by just one tenth of a second in the 300 metres time trial, but her international performances were once again looking like the Smith everyone knew. Again, she achieved individual medals in the European Championships in Ostende, a silver and two bronze and the duo of Smith and Hartley again managed bronze in the relay. At the World Championships, though, in Grenoble, France, Smith went up yet another gear. The track was identical to Vienna where she had fared so well on her senior international debut and Smith knew that she could raise her game, and she did just that. With consistent top 10 placings throughout the Championships, Smith came away with silver in the 3000 metres. Less than two tenths separated her from the winner, Marisa Canafoglia (Italy), who went on to win no fewer than five of the six individual titles. It was still the days when nations could field three athletes in any one event and as a result there was often questionable tactics employed by certain countries. Overcoming these odds it was evident, Smith was back, and on any other day her silver medal may well have been gold. In 1988 she was still steaming ahead. Hartley had taken a sabbatical to concentrate on having a family and Smith was clearly streets ahead of her nearest domestic rival. Nobody could touch her. Her taking all British titles was an almost foregone conclusion, but the margins with which she did so were a yawning chasm compared to anybody else. Despite these "easy" victories Smith knew she still had to work hard to be competitive internationally. Her performance at the European Championships saw her slip out of the top ten just twice out of twelve events (in both the road and track time trials which was no great shock). In fact, now being Britain's only female representative meant that Smith would skate every individual distance and still manage bronze in the 5000 metres elimination on the road. With the exception of the time trials her lowest position would be 9th, quite a remarkable feat over 6 days of intense international racing. A few weeks later the World Championships in Cassano d'Adda, Italy, came round and again Smith hit form with no fewer than four top ten finishes, one of which was a bronze in the 1500 metres. Unbeknown to Smith at that time, though, it would be her last international medal. By 1989 things were beginning to change for Smith. Her dominance domestically still continued and again she was victorious in all British Championships by some margin. In fact, so superior was her class above all others that her winning time for the 5000 metres was almost a full minute ahead of the second placed skater, having lapped the field a number of times, simply because she could. But behind the scenes Smith was at a cross roads. She was now in a serious relationship and for a period her emphasis on skating became secondary. She did not attend that year's European Championships in the Azores but newly wed, bounced back in readiness for the World Championships in Hastings, New Zealand. But it was quite obvious from the outset that all was not going to plan. Out of the four races she competed in she would only finish inside the top twenty just once, and a fall in which she injured her arm prevented any further participation from then on in. It was to be the last time the name Lisa Smith would appear on the team sheet for Great Britain and at the age of 20, after more than 10 years of racing, she left the sport to concentrate on her personal life. Three years later Smith returned to the track and again proved her class could still win through. In 1992 she entered the British Championships, winning the 1500 metres ahead of her old rival Hartley, who herself had made an emphatic return to racing. However, on reflection, her win was more a slip-up for Hartley than a rolling back the years for Smith and Hartley would win the next three titles ahead of her. 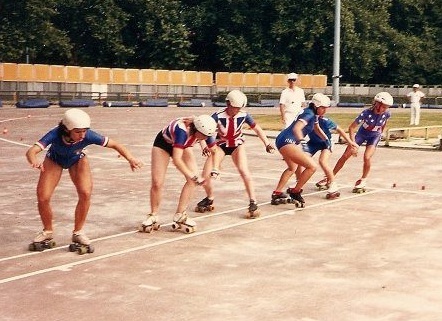 Whilst Hartley was well on her way to an international comeback, Smith knew it was long way back for herself and chose to let the past be the judge of her skating achievements. 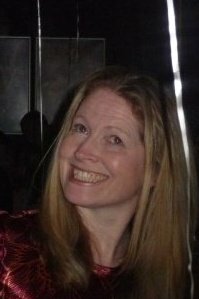 One cannot argue that Lisa Smith was one of the best, if not the best, female skaters Great Britain has ever produced. People quite rightly say you cannot compare eras, but despite this sound reasoning, people always will and let's face it, it will only ever come down to two skaters - Chloe Ronaldson or Lisa Smith. As we are talking about Smith here, let's just look at her statistics - 31 British titles, of which 22 were senior titles and 21 of which were gained over just 5 years; double Junior European Champion; Junior European medallist at just 13; Senior European medallist at just 15; World silver and bronze medallist and still the holder of the 2000 metres British Track Record set 25 years ago! I could go on. What a racer! Her performance was phenomenal. It's not something you register at the time or even consider. It's not until you watch it again now that you realise just how good she was. Since that time she has concentrated on her family and has pursued other interests. More recently, though, she has returned to the skating scene, but this time not speed skating. She has joined the growing throng of people taking an interest in Roller Derby amongst other things. How good she could have been if she had continued? How would she have taken to inlines? Was she burnt out at 20 after so may years at the top of her game? These questions will always remain unanswered. Either way, what is known is that it will be a very long time, if ever, before Britain produces another female skater of Smith's strength, skill and ability. A true British Skating Legend.